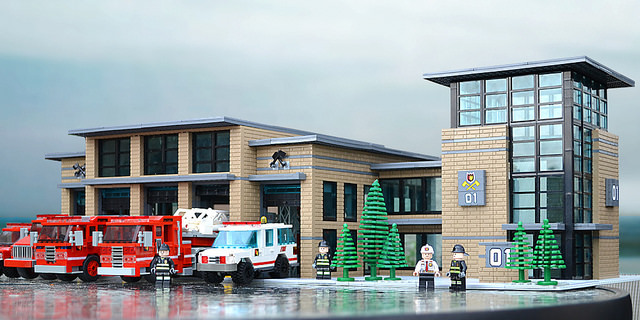 Fire stations are a LEGO staple, both in sets and custom creations. There are many out there, but few as good as this one by S Asbury, who seems to be somewhat of a perfectionist, as indicated by his description of his fire department build: “It took me more than ten years to build a fire station. I’d start one, then start over after deciding it wasn’t up to par.” I must say that all the effort was worth it. The texture, clean lines and strong contrast are obvious characteristics of modern architecture, of which this fire station is a perfect example. The camera angle helps a lot too, putting the observer into the perspective of a minifig, and that is always a good way to make a model appear more immersive. This is gorgeous! Are the instructions available for purchase?